Originally published on Medium 7-Jan-2016. 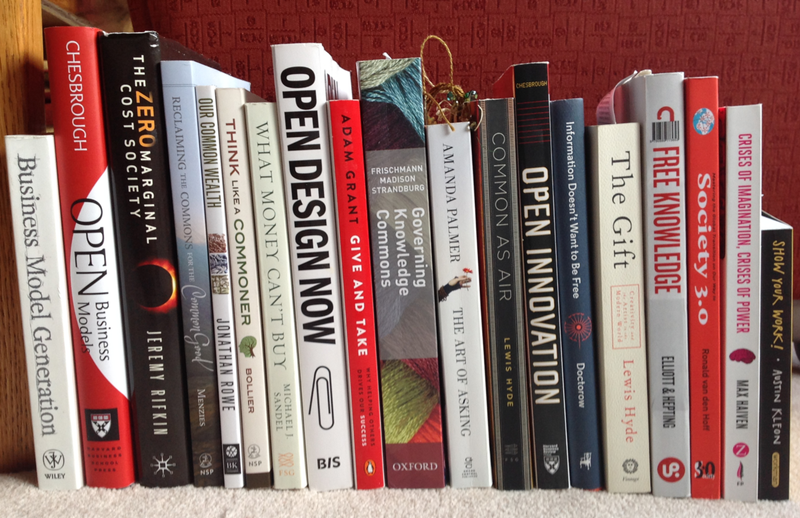 Sarah and I read a ton of books related to open business models in 2015. We’ve referenced a few of them in our writings. The picture above shows most of the books I read in 2015. They are all interesting in their own way (and I encourage you to read them all) but I thought I’d create a 2015 top 10 recommended book reading list from the collection along with a few notes on why each book is of interest. If you have recommendations for books we should read in 2016 leave a note with your suggestion. The best open business model related book I read in 2015. Amanda Palmer’s personal account of her evolution as an artist and the methods she uses toconnect with and get financial support from her fans and followers shows what is truly possible. This is a must read book for anyone trying to transition to an open business model that relies on community engagement. This book establishes a common framework for understanding what makes up a business model. It provides a business model canvas with nine core building blocks and corresponding set of questions as a tool for designing and prototyping business models. 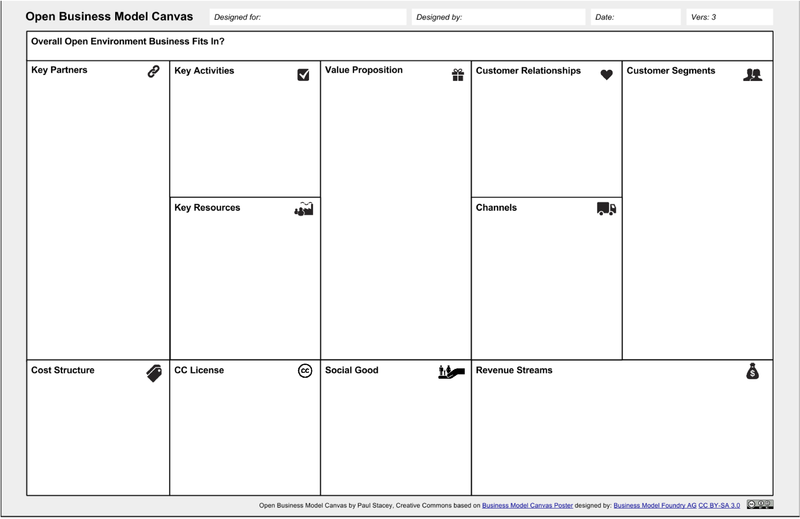 In 2015 our Creative Commons open business model initiative remixed and modified this canvas into an open business model canvas and associated questions. We used this for everything from analyzing how open companies are, to designing open business models for startups, and as a hands on activity in workshops helping people create their own open business model. Try it out for yourself! This book is a wonderful collection of essays exploring how knowledge is generated and shared, and to what purpose. It pays particular attention to the rapid appropriation of public knowledge for private benefit around the globe and across multiple sectors and disciplines. Specific examples in education, the pharmaceutical industry, biomedical research, and even seeds are explored. Alternatives to this commodification of knowledge are described including indigenous and traditional knowledge and open access research publishing. Some pretty profound emerging ideas reframing the future are put forward including the economics of information in a post-carbon economy and the study of abundance. An a-ha book for me as referenced in earlier Medium writings. This book describes how the capitalist era is passing and being replaced with a new economic paradigm it calls the “collaborative commons”. It documents how the collaborative commons is changing a wide range of fields from renewable energy, to marketing, logistics, transport, education, manufacturing and health care. It explores how the two economic systems currently work in tandem and sometimes compete. However it argues that technologies impact on the economy has already created a marginal cost of zero model that wreaks havoc with the capitalist model and new forms of sharing and collaboration are further leading to its decline. A fascinating depiction of an emerging new economy. This book contributes to evidence-based policy making about innovation and creative production in the knowledge commons. It draws on Elinor Ostrom’s Nobel prize winning work around natural resource based commons and adapts that work to the knowledge and information commons. It’s an important book for the way it adds a third approach to traditional views of methods for promoting innovation and creativity. The two traditional approaches are, 1. innovation systems organized around markets, supported by intellectual property rights directed to exclusivity and ownership, and 2. innovation systems organized around governments, which intervene in markets in various ways to sponsor and subsidize innovation. The third approach explored in this book is commons-based sharing of knowledge and information to produce innovation and creativity. Written by one of our Kickstarter backers this book describes society in transition. It documents how the web, social capital, and value networks, are creating an interdependent economy and new ways of not only doing business but functioning as a society. It shows how this transition is playing out in the environment, work, money, democracy, education, health and even the organization of businesses. Written with a particular critical eye on the state of affairs in Europe this book describes and advocates for new ways of governing and functioning as a society. It provides some good insights on social, co-creation, and transactional business concepts with specific suggestions and examples of how to set up and operate a new kind of business. This book traces the history of the commons and dispels the myth of the “tragedy of the commons”. It presents the commons as an ageless paradigm of cooperation and fairness and suggests that it is re-emerging as a practical new form of self-governance and production controlled by people themselves. A key aspect of this book is helping us all think differently and seeing the commons as a framework for social action and value production. Does a good job of exploring the logic of the market and the commons. Not a new book but an important one for the way it explores the artist’s dilemma. At its core this book investigates the way that “every modern artist who has chosen to labor with a gift must sooner or later wonder how he or she is to survive in a society dominated by market exchange.” Examines the anthropology of gifts as a kind of property and gift exchange as a kind of commerce. Important for the way it delineates the differences between a gift and a commodity and for describing the human aspects of gift giving and sharing. Quoting the promotional blurb “Can small artists still thrive in the Internet era? Can giant record labels avoid alienating their audiences? This is a book about the pitfalls and the opportunities that creative industries (and individuals) are confronting today — about how the old models have failed or found new footing, and about what might soon replace them.” As others have done it emphasizes the importance of building an audience through open sharing. It also examines past business strategies of creative industries and shows how they have been adapted to the Internet. Most provocative of all it looks at how ever increasing copyright laws mess up artists and endanger privacy, freedom and our digital lives. The commons has been increasingly enclosed and commoditized by government and market forces for decades. Technology and the Internet have generated a distributed and participatory means of production and can store and distribute goods at near zero cost. Zero marginal cost creates abundance (or the potential for abundance) which traditional market economics has no model for. The commons has new relevance, particularly the digital commons, and is re-emerging as an important alternate means of achieving social and economic aims. The commons is not just a place with content and resources but a social process, enabled by technology, that involves people participating, co-operating, sharing, and collaborating. The social process of commons practice is affecting all sectors of society including education, manufacturing, health, energy, work, and even money itself. The re-emerging commons does not mean the elimination of business or work but does mean business and work are done differently. Commons-based ways of working and doing business are being invented right now and must co-exist and sometimes compete with existing models. Originally published on Medium 15-Dec-2015. 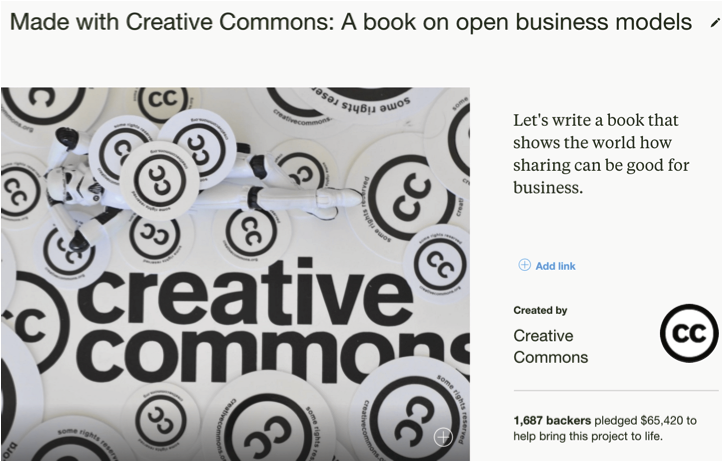 This is the second in a series of six Medium articles connected to the research underway by Creative Commons for its Kickstarter-funded book about open business models to be published summer 2016. This work has three parts. Part 1 explores how open businesses models are based more on abundance than scarcity. Part 2 continues that exploration with an eye to how abundance affects design and development of open business model strategies. And finally, in Part 3 we get down into specifics around how open business model organizations generate revenue to sustain and thrive. Part 1: A dialogue between abundance and scarcity. Imagining a post-scarcity world has long been the domain of science fiction writers and futurists. Replicators producing goods in great abundance. Societies where basic human needs are fulfilled cheaply or even freely. People freed from the need to work or earn money. The activities and lives of humans living in abundance. These are the realm of Star Trek or books like Culture and Down and Out in the Magic Kingdom. These ideas have no relation to the here and now. No, no, no, the here and now is governed by scarcity based economics. We all know about the shortage of water, food, energy, clothing, education, medicine, and other goods. Too much demand and not enough supply. Scarcity, that’s the here and now. That’s what drives the market. Supply and demand determining prices. And price determining who has access and who gets what goods. But wait — aren’t digital goods different? In the digital world the incremental cost of storing, copying, and distributing digital goods is next to zero. And Creative Commons licenses on digital goods make explicit permission to replicate, share, and reuse. This creates the possibility for abundance. And we certainly are seeing a growing abundance of works in the Commons. 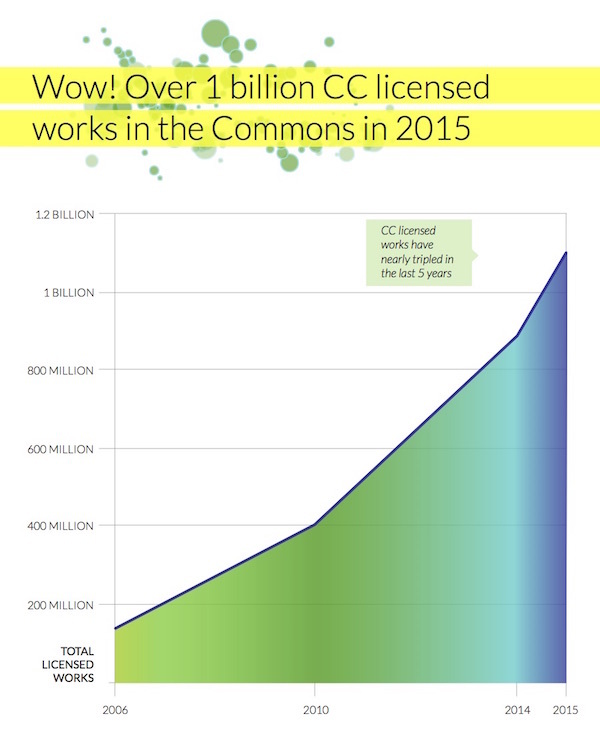 Over 1 billion according to the latest Creative Commons State of the Commons report. No, no, no, to prevent abundance we’ll create artificial scarcity through “digital rights management”. We’ll put locks, passwords, and controls on digital goods to prevent them from being accessed, changed, or replicated. That way we can control digital goods the same way as physical resources and existing economic models and revenue streams are maintained. Do we really need to hobble technology for economic gain? Do we really need to rely on artificial scarcity to prop up society and its scarcity-based economic model? What are the implications for the economy and society if we go with an abundance model? Can we even imagine it? Rifkin introduced me to abundance, but Free Knowledge was the a-ha moment book where the limitations of scarcity-based economics were made evident. Ever since then I’ve been having thought experiment dialogues in my head like the one at the start of this post. Mental conversations between scarcity and abundance. I’ve been noticing the vision and mission statements of the open businesses and organizations Sarah and I are speaking to are about abundance. What if, to generate your own open business model, you flip the traditional economic scarcity-based model on its head and focus on abundance? What if, as an open business, you focus on what is it you have that you can strategically make freely and openly available to everyone? I began seeing maximizing abundance as a key open business model strategy. I quickly saw how open businesses leverage the permissions Creative Commons licenses provide to put assets out in the world in a way that encourages use, participation, contribution, and enhancement. The Noun Project, Wikimedia, and Thingiverse all do that. They make digital assets abundant and invite everyone around the world to use, contribute to, and enhance that abundance. I also began seeing how abundance isn’t just about maximizing availability of open digital assets but also about maximizing abundance of participation. Open business vision and mission statements couple an aim for abundance of resources with a recognition that getting there is a collective group activity. Abundance isn’t solely created by a single open business or organization. It is collectively created by a global network of people who affiliate themselves with the open business and collectively worked toward a shared goal. Edward Boatman, co-founder of the Noun Project, may have created the original set of icons and symbols that got the Noun Project’s visual dictionary going but he didn’t conceive of a business where he’d author the entire world’s visual dictionary himself or bring on Noun Project employees to do so. Instead maximizing icon and symbol abundance is collectively being done by over 7,000 designers from all over the world contributing their work to the Noun Project. In creating your own open business model think about how you will engage the world in adding to, improving, and expanding use of what you’re making freely and openly available to everyone. “Build a community around your content” as my colleague Sarah Pearson says. Sustainability is based on the ability for anybody to improve and share. And you can also see I’m not the only one who thinks this work is helping us learn new processes, new kinds of organizations, and yes even a new form of economics. These ideas about abundance are all a bit raw for me still. I’m still thinking it through, but seeing open business models as being about maximizing abundance of digital assets and abundance of human participation has been really useful. It’s helped me frame how I think about open business models, generated a couple of strategies for creating your own open business model, and provided a lens through which to look at and analyze existing open businesses. Scarcity based economics seeks only to maximize monetary value, abundance-based economics and open business models seek to maximize a more diverse set of values. The degree to which an open business can engage participation in what it does is dependent on the extent to which others buy in to the value the business seeks to achieve. Open businesses generate value for others, not just themselves, and that value can take many forms — knowledge, culture, relationship, livelihood, well-being … Open businesses aren’t blind to money, but what drives them, what motivates them, the values they operate by and the value they seek to create is more diverse than just monetary value for themselves. As an open business how will you maximize the abundance of value you create? All this abundance-based economics talk is well and good but you’re probably saying to yourself, today, right now, most of the world is operating on the basis of scarcity-based economics. How do abundance-based open businesses survive in such a world? Just how does the money part work in an open business model anyway? How can open businesses not only survive but thrive? Lets set aside thought experiments and get down to the money. It’s true, during this transition time while inventing a new abundance-based economic model open businesses must include monetary value in the mix of value they create. Lets look at the money part of how the open businesses work. Lets look at a real examples from open organizations and businesses already mentioned in this post. Lets start with the simplest one first. Wikimedia is a 501(c)(3) charitable organization. More than 4 million donors around the world donated $75 million USD to Wikimedia last year. Here’s a link to their 2014–15 Fundraising Report. This is yet another way Wikimedia makes it possible to participate. Donating money for their operation is an expression of support for the value they are creating. It’s worth pointing out that the actual content Wikimedia has on its sites like Wikipedia are created by volunteers. Editors do not get paid (in general). Wikimedia aspires to be an unbiased, accurate and trusted resource which can be undermined when entries are created through paid advocacy — seehere for example. The Noun Project has a very unique business model. It’s also one of the few examples where Creative Commons licenses are at the very core of the model. Co-founder Edward Boatman spoke wonderfully eloquently about it during our interview. Here’s my simplified version of how it works. 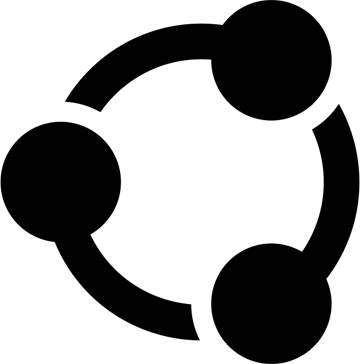 Icons and symbols on the Noun Project are Creative Commons CC BY licensed. Free membership entitles you to download and freely use those icons at no cost — as long as you give attribution and credit to the creator as specified by the terms of the Creative Commons license. To provide proper credit, you can use the embedded credit already in the icon you download, or you can copy the credit line they provide and add it to your citations, about page, or place in which you credit work you did not create. In the Free Membership model, if you don’t want to give credit and attribution to the creator you can purchase the symbol or icon for $1.99. The Noun Project splits this revenue roughly 70% to creator and 30% to Noun Project. If you don’t want to purchase a la carte through the Free Membership plan you can go with the premium NounPro unlimited plan where $9.99/month gets unlimited downloads and no requirement to attribute/credit the creator. Revenue from this is shared roughly 40% to creator and 60% to the Noun Project. Operating the premium NounPro plan requires the Noun Project to offer a lot of services, outside of the icon itself. This additional effort results in a higher revenue percentage going to the Noun Project. The Noun Project also has an API option that lets you get a direct feed of Noun Project icons and symbols into a your application or service. They have a Playground and API Pro version. Royalty payments to creators are now calculated by adding revenue from the API project to revenue from premium NounPro subscriptions and dividing that total revenue by number of downloads. Numerator and denominator fluctuate on a monthly basis, which means royalty payments fluctuate too. I really like the way the Noun Project values its creator community and shares revenue with them. However, when we spoke with Edward Boatman he told us that based on feedback from their creators the #1 reason they participate in the Noun Project is its mission. They really like the idea of putting their work out there and helping others. Money is the #3 reason. #2 is promoting their own personal brand. This is a good example of value abundance. The model of free use as long as credit and attribution are given and requiring payment if users don’t want to give credit is a novel idea. All Creative Commons licenses require attribution be given to the creator so this model really draws on the way Creative Commons works. I’ll be very interested in seeing whether any other open businesses replicate this model for themselves. Lets look at one last one — Opendesk. “Opendesk is a global platform for local making. You can use it to download, make and buy work space furniture. Opendesk has a global network of makers and a collection of furniture by a range of international designers. Because that furniture is designed for digital fabrication, it can be downloaded as a digital file and made locally — on demand, anywhere in the world. I really like the way the Opendesk global platform is making furniture designs abundant. I’m especially intrigued by the way Opendesk converts a global digital abundance into a local produced physical good. I like the idea of being able to tell a story about workspace furniture where the design came from around the world but was made just around the corner. Of all the open business model organizations I’ve spoken to so far Joni Steiner and Nick Ierodiaconou, co-founders of Opendesk have been the most open about commercial intent and our conversation around their business model ranged wide and deep about how to design one that works. In designing a business model to achieve those goals they gave a lot of thought to three angles – 1) social sharing potential, (2) support for license choice, (3) impact of license choice on business model. In support of social sharing Opendesk actively advocates for open licensing. However, designers have choice. They can be proprietary or choose from the full suite of Creative Commons licenses deciding for themselves how open or closed they want to be. For the most part designers love the idea of sharing content. They understand that you get positive feedback of attribution and what Nick and Joni called “reputational glow”. And Opendesk does an awesome job profiling the designers on the platform. I especially like seeing furniture designers, not often recognized for their work, be so highly profiled. While designers are largely OK with personal sharing they do have a concern that someone will take the design and manufacture the furniture in bulk without the designer getting any benefits. This has led most Opendesk designers to choose Creative Commons Non-commercial licenses. Or, users can buy the product from Opendesk or a registered maker in Opendesk’s network. You might think of this as on-demand personal fabrication. The Opendesk maker network is currently focused on makers who do digital fabrication via a computer controlled CNC machining device that cuts shapes out of wooden sheets according to design file specifications on the computer. Makers benefit from being part of OpenDesk’s network by getting paid work making furniture for local customers. Opendesk generates business for makers. Nick and Joni said “Finding a whole network and community of makers was pretty easy because we built a site where people could write in about their capabilities. Building the community by learning from the maker community is how we have moved forward.” Opendesk now has relationships with hundreds of makers in countries all around the world. When a customer wants to buy an OpenDesk through our Marketplace model (or by just getting in touch directly with a maker), the maker is responsible for managing customer communication and providing a quote for the product. Like the Noun Project Opendesk shares revenue with their community of designers. According to Nick and Joni a typical designer fee is around 2.5% so Opendesk is being more generous, with 8%, and providing a higher value to the designer. Moving forward Opendesk is looking to recast the whole idea of openness. To them the sharing economy has shown how you can disruptively scale an idea. Instead of building a business model around IP or design exclusivity Opendesk is starting with openness, sharing, and abundance. Their model focuses on value-added services and experiences for which a fee can be charged — similar to models used in the open source software world. Even more fascinating is the way Opendesk is working openly to engage everyone in helping define how this model should work. OpenMaking is a public domain resource developing open standards in keeping with new and social forms of design and manufacturing, working with a community of thought leaders and practitioners to define this new movement and discuss how we will produce and consume in the 21st Century. I’m only skimming the surface of the broad and deep conversation we had but this gives you the gist of Opendesk’s business model. It’s clear that openness and revenue generation aren’t mutually excludable. There are many ways to earn revenue based on abundance — these three examples show what’s possible with some creative thinking. Open business models start with abundance, a spirit of generosity, an act of sharing. Success and sustainability of open business models depends on the extent to which assets, participation, and value is made abundant. Open business models generate value in many forms — one of which is financial. This isn’t science fiction. Abundance is a generating a new kind of economy right now. Special thanks to the organizations profiled in this post for showing how this is possible. And to the many millions of people who share using Creative Commons, thank you for creating abundance. As I engage in this work. I’ve decided to do more than just write about it. I’ve decided to directly experience it, to experiment with it. To not just observe and analyze but to actively participate in it. Try it out myself. Even invest in it. Here’s a few of the ways I’m doing that with invitations for you to join me. Images in this post are all from the Noun Project. I’ve given attribution for each and technically, as per the Noun Project’s business model, am allowed to use them for free. However, I chose to pay for them too. Thought I’d experiment with the business model and give extra thanks to the creators. I encourage you to use Noun Project images yourself. I’m also interested in using Noun Project images in the book we are writing. What Noun Project images do you recommend we consider using? Leave me a note with your suggestions. I’m interested in getting an Opendesk Edie table and I was excited to see Opendesk has a fabrication partner called Makerlabs in Vancouver. However, ordering notifies me the Edie table is fabricated in quantities of 2 — and I only want 1 (costs about $330 CAD for one). I asked Joni and Nick at Opendesk “Is there some way to team up with someone else in Vancouver to make such a purchase with each of us getting 1 table?” They replied, “We aren’t at the scale yet to have frequent enough orders all around the world to combine them — but when we do we will look to bring in a ‘group-making’ feature where we can team up smaller orders — I think this will be really powerful in serving smaller orders and items, but it’s not something we have up and running quite yet.” They also super helpfully linked me up to Kirsty at Makerlabs in Vancouver to help take me through the quoting / ordering / getting made locally in Vancouver process. Thought I’d see if there is anyone else locally in Vancouver interested in an Edie table who wants to join forces with me and place an order? Leave me a note.